The Close option within the Editor's Popup Settings box contains 2 option categories. Override a popup's close button text, and delay the appearance of the popup close button. Note: Popup 'Close Settings' should be set and styled in the 'Popup Themes' Editor. The popup theme should then be applied via the 'Display -- Appearance' option settings of the Popup Settings box. 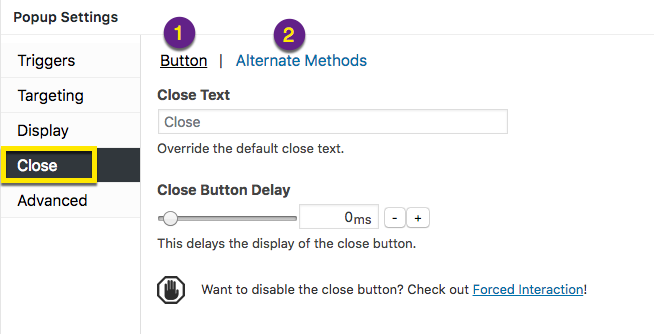 Close Text -- Override the value set by the assigned popup theme's Close Button Text. 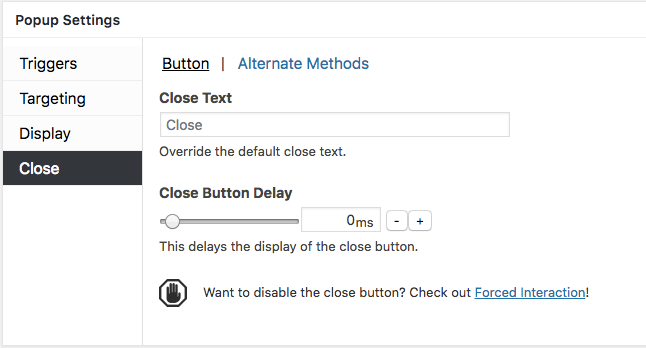 For example, a value of 'CLOSE' set at Popup Maker >> Popup Themes >> Close >> Close Button Text could be changed to 'X' for a single popup. To maintain a consistent style across all popups, use the Close Button Text set in the Popup Theme Settings box. Default: Value set by the Popup Theme at Popup Settings >> Display >> Appearance. To entirely remove the Close button from a popup so that visitors must interact with the contents of a popup, install the Forced Interaction extension to Popup Maker. Close Button Delay -- Delay the appearance of the close button when a popup opens. This may increase visitor engagement with the popup's contents ( reading, clicking a link, or submitting a form ). Default: 0 ms (milliseconds); close button appears at the same time as the popup. Delay range: 0 - 3000 ms (0 - 3 seconds). By default, a popup is closed by selecting the Close button displayed in the popup container. Several alternative methods allow visitors to close a popup by clicking on the popup overlay layer, or using their keyboard. By default, each of the following methods is not enabled (turned 'off'). Click Overlay to Close (checkbox) -- Allow visitors to close a popup when the popup overlay layer is clicked or touched. The overlay layer is the area outside the popup container. Activating this feature provides visitors a larger area to close a popup. The expanded close feature will even work when the overlay layer is disabled. Related article: The 'Display' option settings includes a 'Disable Overlay' option. See Popup Settings >> Display >> Advanced to turn off the overlay layer. Press ESC to Close (checkbox) -- Allow visitors to close a popup by using their keyboard Escape (ESC) key. Press F4 to Close (checkbox) -- Allows visitors to close a popup by pressing their keyboard. In the Windows operating system, the keyboard F4 function key allows users to close application windows and programs. When enabled, this feature extends that capability to all plugin users, regardless of their operating system.